Since 2010, SoCo has focused on being scratch-made and intimate. Whether you’re having dinner or getting married here, your experience is small-batch and personalized. Your food is prepared and served by the husband-and-wife team who lives here and runs the farm. Jeremy, the chef, is the only person in the kitchen. A recovering military brat, began cooking professionally in ’99 with Food&Wine Best New Chef James Mazzio and most recently served as sous chef to chef Vivian Howard of Chef and the Farmer. Kimberly, a recovering graphic designer and an eNC native is the General Manager, Wine Director and Executive Farmer. She will be seating you, and serving you. They love what they do, and have kept SoCo small so you can have a grand experience. SoCo stands for “Southern Comfort.” This—along with the vision of eating well and eating local—is at the heart of the food and atmosphere SoCo creates for its guests. 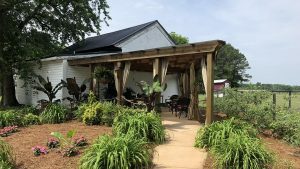 When this farm and restaurant were founded, the goal was to give people a unique dining experience; including creative, made-from-scratch food using wholesome NC ingredients. Located on an 11-acre farm in Wilson, NC where most of the organic vegetables, fruit and natural poultry are grown for use in the restaurant. The remainder of the ingredients is proudly source locally, which is easy in a region as agriculturally rich as eastern North Carolina. Recipes courtesy of Chef Jeremy Kulers.